Diabetes mellitus (DM) is characterized by hyperglycemia caused by a lack of insulin, insulin resistance or both. 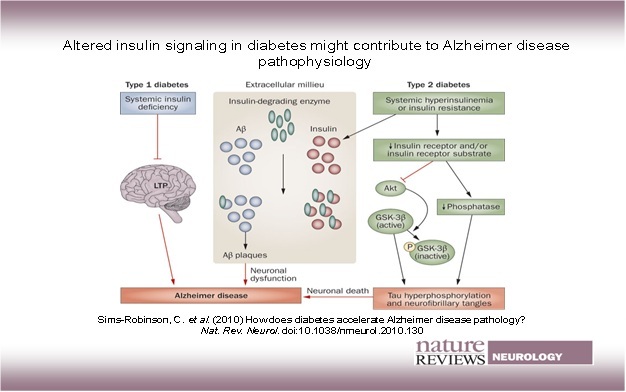 There is increasing evidence that insulin also play a role in Alzheimer’s disease (AD) as it is involved in the metabolism of β-amyloid(Aβ) and tau, two proteins that for Aβ plaques and neurofibrillary tangles (NFTs),respectively. DM is associated with pathological changes in numerous peripheral organs, such as eyes, kidney and peripheral nerves, but it also affects the central nervous system (CNS). Diabetes mellitus is associated with changes in cognition. In type 1 diabetes mellitus this association is shown by a mild to moderate slowing of mental speed and a diminished mental flexibility. In type 2 diabetes cognitive changes mainly affect learning and memory, mental flexibility, and mental speed. Several large population-based studies have shown that the rate of cognitive decline is accelerated in elderly people with type 2 diabetes. 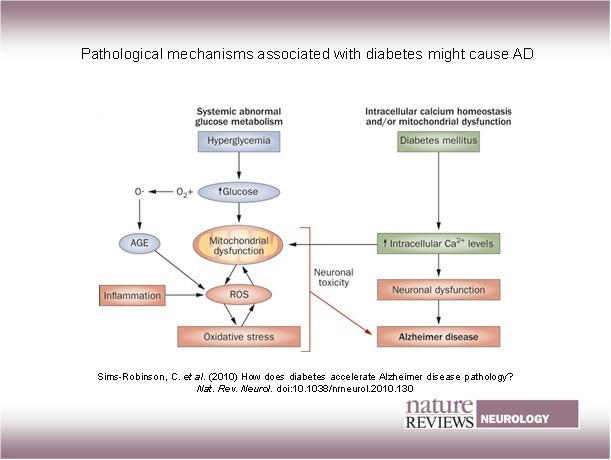 Diabetes(T2DM) and Alzheimer disease are both common diseases in elderly individuals: numerous epidemiological studies demonstrated that diabetic patients have a significantly higher risk of developing AD, independent of the risk for vascular dementia. A more recent study suggested that type 2 diabetes or impaired fasting glucose might be present in up to 80% of patients with Alzheimer’s disease. Glucose is the exclusive energy source for neurons. The brain consumes 18-30% of total body glucose. Therefore deficit of glucose and its transport and utilization result in neuronal damage and functional deficits. Because the brain cannot synthesize glucose nor store more than a few minutes supply as glycogen, the brain requires a continuous supply of glucose from the circulation. Therefore, disruption of the supply of exogenous glucose will rapidly cause functional disturbance. 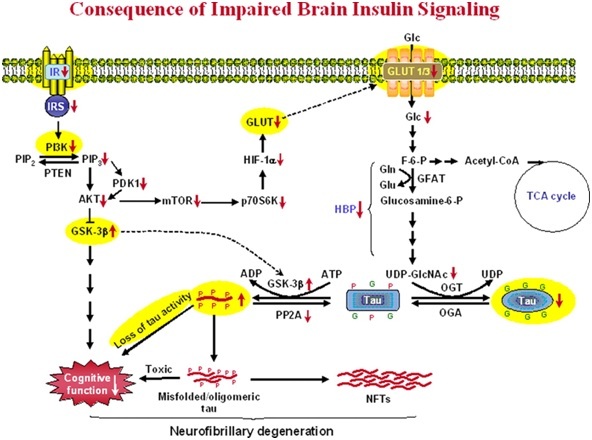 In fact severe hypoglycemia can lead to permanent brain damage and mental retardation, so as hyperinsulinemia and hyperglycemia in the brain development cause neuronal death. Though T2DM results in chronic hyperglycemia, which impairs glucose metabolism via ineffective glucose transport, depriving the neuronal cells of their major mechanism for metabolism and thereby producing serious complications that contribute to AD pathology. Type I diabetic patients depend on insulin injections for survival and this results in substantial fluctuation of glucose concentrations in response to food ingestion, exercise and the insulin injections themselves. A decisive pathophysiological consequence of the markedly perturbed glucose metabolism is a decrease in ATP production from glucose. The deficit in neuronal glucose availability may be partially balanced by the utilization of endogenous brain substrates(amino acids and fatty acids) to meet the energy demand of the brain. In early-onset familial Alzheimer disease, amino acids in particular glutamate, are used for energy formation to maintain ATP concentrations at a normal level . These abnormalities in cerebral glucose utilization include a diminished activity of key glycolytic enzymes and as a side effect of glumatate utilization, neurotoxic ammonia is formed in the brain and inhibits mitochondrial dehydrogenases such as α-ketoglutarate dehydrogenase, isocitrate dehydrogenase and pyruvate dehydrogenase. 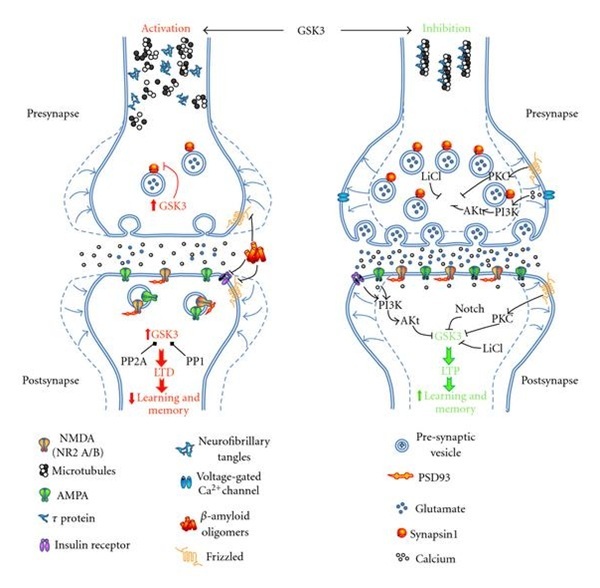 Reduced pyruvate dehydrogenase activity results in a decreased level of acetyl-CoA, and together with the diminished activity of choline-acetyltransferase, the synthesis of acetylcholine in the presynaptic neuron is markedly reduced . Degeneration of the cholinergic system correlates with the progression of mental disturbances in patients with Alzheimer disease. A possible link between blood sugar, insulin resistance and inadequate production of acetylcholine (ACh). Synthesis of ACh involves the enzyme acetylcholine transferase (ChAT). Acetylcholine transferase is expressed in cortical neurons; and its expression increases with insulin/IGF-1 stimulation. In AD, ChAT co-localization in insulin or IGF-I receptor-positive neurons is reduced. Therefore, low insulin levels and insulin resistance can contribute to a decrease in ACh levels, which represents a possible biochemical link between diabetes mellitus and AD. Diminished O-GlcNAcylation is considered to be a major molecular mechanism through which impaired glucose metabolism confounds T2DM and AD. Finally,the glucose transporter 1 (GLUT1), that is the major glucose transporter expressed in the endothelium of the blood brain barrier, it is reduced in aged human and coincides with hippocampal atrophy suggesting impaired glucose transport from periphery into the CNS is correlated with neurodegeneration. 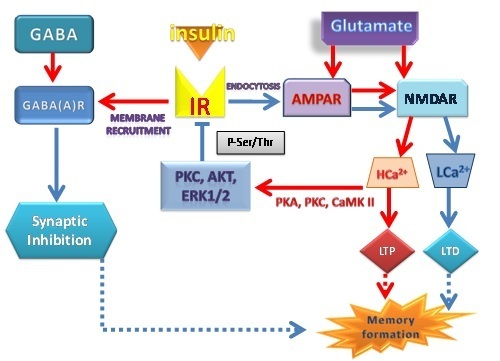 Insulin resistance is characterized by reduced responsiveness of insulin receptors and decreased downstream signaling for the response of insulin stimulation. To compensate for these dysfunctions, the islet β-cells of the pancreas secrete more insulin, thereby creating a state of hyperinsulinemia. Insulin resistance with hyperinsulinemia constitutes the core feature of T2DM and is frequently also observed in AD patients. Insulin is transported actively across the blood–brain barrier and might even be produced locally in the brain. The insulin levels usually rise with aging and its excessive levels are associated with functional decline in the CNS. Study of gene expression show that molecules involved in insulin and insulin growth factor signaling pathway are altered in the AD brain. The IRb are widely and irregularly distributed throughout the CNS in distinct patterns, including pyriform cortex, hippocampus, amygdale, hypothalamus and olfactory bulb, with higher concentrations in cerebellum and choroid plexus. Another receptor from the same protein kinase receptor family is the structurally similar receptor for human insulin-like growth factor (IGF1R) . Both consist of two α- and two β-subunits and are the product of a single gene: IR on chromosome 19 and IGF1R on chromosome 15 . Insulin and IGF bind to both receptors with different affinities. A receptor in the same family, IGF2R, is structurally distinct from IR and IGF1R, binds IGF-I and IGF-II (two different types of IGF), but does not bind insulin. The regional localization of IRb, IGF1R, IGF2R are similar, and the actions of insulin and IGF overlap. In chronic uncontrolled DM, the concentration of circulating cortisol increases, which adversely affects cognitive functioning. Also, levels of cortisol in the CSF are higher in patients with Alzheimer disease .This may be caused by a disinhibition of the hypothalamic–pituitary–adrenal axis, leading to an increase of its basal tone and to hypercortisolemia, which may compromise the function of the neuronal insulin receptor via its dysregulation of the phosphorylation of tyrosine residues in the receptor. In db/db mice (the well-known T2DM model), enhanced corticoid activity has been shown to result in impaired synaptic plasticity and decreased neurogenesis, thereby yielding learning and memory deficits and providing evidence that increased cortisol contributes to the neurodegenerative complications of T2DM. With respect to AD, elevated levels of cortisol have been correlated with the extent of hippocampal atrophy, decreased cognitive performance, and rapid decline. Insulin receptor interact with neurotransmitter receptor: Insulin regulates inhibitory transmission and synaptic depression pathway by regulating AMPA (α-Amino-3-hydroxy-5-methylisoxazole-4-proprionic acid) and GABA (γ Amminobutryic acid)receptor trafficking. 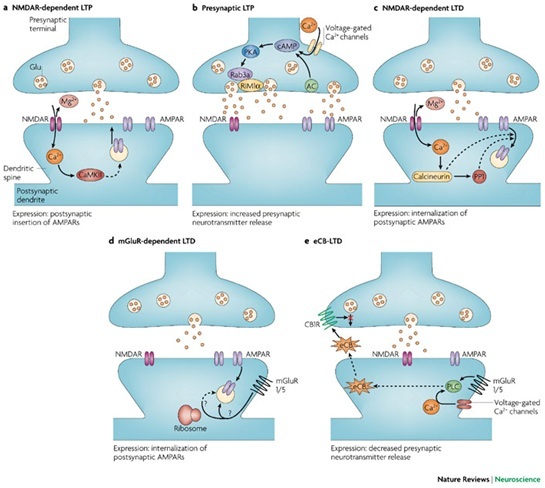 The AMPA receptor is the primary responsible for basal synaptic transmission, activation of NMDA (N-methyl-D-aspartic acid)receptor and expression of LTP (long-term potentiation) and LTD (long-term depression) . After that binding of neurotransmitter glutamate, the AMPA receptor triggers a depolarization of the synaptic membrane, consequently at voltage change, NMDA receptor is blocked by Mg2+ coupled with glutamate, results in activation of the NMDA receptor and Ca2+ influx. The high concentration of Ca2+ (HCa2+) influx acts as a second messenger to trigger activation of a variety of Ca2+ dependent protein kinases that are required for formation and maintenance of long-term potentiation. Insulin may modulate long-term potentiation, it can be induced by NMDA receptor activation, thus increasing neuronal Ca2+ influx. A high intracellular concentration of Ca2+ presumably activates α-calcium-calmodulin-dependent-kinase II (CaMKII) and other Ca2+-dependent enzymes(Ser/Thr kinases,MAPK and Akt), which results in stronger synaptic associations between neurons. The protein activated from high levels of calcium inhibits IR tyrosin kinase by increasing Ser/ Thr phosphorylation of IR or IR substrates. Between insulin signalling pathway intermediates , GSK3 would appear that is critical for the induction of memory formation, switching off LTD and allowing LTP to occur. There are two GSK3 genes from which derive GSK3α and GSK3β that are ubiquitously expressed, constitutively active, involved in a variety of cellular processes including glycogen metabolism, gene transcription, apoptosis and microtubule stability. Insulin signaling leads to the activation of PI3-kinase and subsequently the activation of Akt, which in phosphorylates free cytoplasmic GSK3β and GSK3α at serine (Ser) residues 9 and 21, respectively. This phosphorylation blocks the active site preventing the enzymatic activity of GSK3 towards primed substrates, while de-phosphorylation leads to its activation. GSK3 is deregulated in AD through alterations in upstream Wnt and GSK3 is negatively regulated by both the Wnt and insulin pathways. Over-expression of GSK3 prevents the induction of LTP and causes a decrease in spatial learning. Inhibitors of GSK3β have also been shown to block long-term depression (LTD) and GSK3β activity is enhanced during LTD. The insulin on neuron induces a rapid internalization of AMPA receptor, via clathrin dependent mechanism, that removal of AMPA receptor from the synapse is associated at LTD, similar to that the induced by low concentrations of Ca2+ (LCa2+ ) . Glutamatergic transmission leads to an increase of intracellular Ca2+, and cAMP/cGMP levels triggering cascades that will ultimately lead to the phosphorylation and activation of the transcription factors cAMP responsive element binding protein (CREB) and serum response factor (SRF). Activation of CREB and/or SRF can lead to the expression of plasticity-related genes, which in turn promote the functional and morphological changes necessary for neuronal plasticity to occur such as alteration of cytoskeleton protein complexes and remodeling of dendritic spines. CREB is one of the most important molecules in neuronal plasticity processes and learning and memory. Activation of insulin signaling also potentiates GABA transmission by recruiting GABA (A) receptors to the membrane surface. GABA (A) receptors are the principal inotropic GABA receptor in the CNS and mediate inhibitory synaptic transmission throughout the brain including hippocampus and cerebral cortex. Insulin also modulates CNS concentrations of neurotransmitters, such as acetylcholine and norepinephrine, which influence cognitive function. >Cognition and involvement in aging-related neurodegeneration. Several mechanisms that mediate the toxic effects of hyperglycaemia, are also implicated in the ageing process of the brain. In fact, the cognitive changes and brain atrophy in patients with diabetes mimics certain aspects of brain ageing. 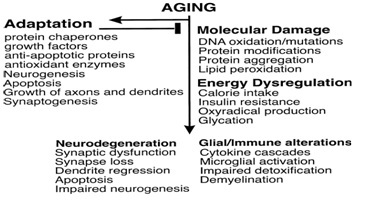 Aging of the brain is associated with a multitude of inherent changes in cerebral glucose/energy metabolism, its control, and related pathways at cellular, molecular and genetic levels. – dysregulation of intracellular pH. One hypothesis involve the transcriptional factors FoxO. Both in Alzheimer’s disease and in insulin resistance (InsRes), oxidative stress is an important pathological factor. Forkhead box class O (FoxO) transcription factors are involved in both insulin action and the cellular response to oxidative stress, thereby providing a potential integrative link between AD and InsRes. FoxO proteins are implicated in the regulation of cellular proliferation and differentiation, cell survival and apoptosis and, therefore, in the development of proliferative diseases and age-related changes. Binding of insulin to the insulin receptor stimulates the PKB pathway, resulting in the phosphorylation of FoxO proteins and their subsequent nuclear exclusion. This FoxO inactivation involve a downregulation of the expression of gluconeogenic genes and of hepatic gluconeogenesis. Under conditions of oxidative stress, JNK are activated, that to inhibit the intracellular insulin-signalling pathway, thereby promoting InsRes. This leads to activation FoxO transcriptional activity of gluconeogenic enzymes, so resulting in systemic hyperglycaemia and hyperinsulinaemia, which may promote the development of AD. JNK also directly activate γsecretase, contributing to βamyloidogenesis and the formation of NFT. Toxic effects of high glucose concentrations are mediated through an increased flux of glucose through the polyol and hexosamine pathways, disturbances of intracellular second messenger pathways, an imbalance in the generation and scavenging of reactive oxygen species, and by advanced glycation of important functional and structural proteins. These processes can affect brain tissue directly, but can also lead to microvascular changes.So, diabetes might evoke more widespread microvascular changes in the brain by this process. DM could affect the pathogenesis of AD through other mechanisms than modulating Aβ metabolism. One possible mechanism is cerebrovascular alteration, a common pathological change in DM and AD. Accumulating evidence suggests the importance of Aβ-induced cerebrovascular dysfunction in AD and cerebrovascular disease is a major complication of DM. Vascular inflammation or oxidative stress mediated by the receptor for advanced glycation end products (RAGE) has been shown to be a possible mechanism for vascular dysfunction in diabetes . Chronic hyperglycemia induces the creation of advanced glycation end products (AGEs) via Maillard reactions(non enzymatic glycation), during which reducing sugars can react with the amino groups of proteins,lipids and nuclei acids to produce cross-linked complexes and unstable compounds. Therefore, AGEs mediate various complications of diabetes by interacting with the receptors for AGE (RAGE) present in the vascular cells and microglia, which enhances various inflammatory processes and oxidative stress. Furthermore, increased AGEs can contribute to amyloidosis and tau phosphorylation in AD. Indeed, the immunoreactivity of AGEs was markedly increased in Aβ plaques and neurofibrillary tangles. Therefore, increased AGEs may be another important factor shared by T2DM and AD. 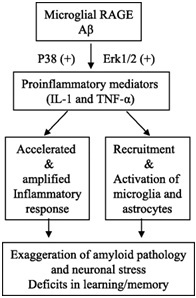 On the other hand, increased inflammatory mediators such as tumor necrosis factor α, interleukin-1β, and interleukin-6 are induced not only by AGEs by its interaction with RAGE, but also by hyperinsulinemia itself. Moreover Aβ can interaction with RAGE in neuron and to mediate disruption of LTP, thus RAGE also functions as a putative Aβ receptor and plays a significant role in AD . Another potential link involves a c-Jun NH2-terminal kinase (JNK) pathway. A common feature of AD and DM is amyloid deposition in target organs; Aβ and tau in AD brains, and amylin in pancreatic islets of type 2 diabetes. Deposition of amyloid in brain and pancreatic islet cells represents a pathogenic similarity between AD and T2DM. Pancreatic amyloid is produced in β-cells and is co-released with insulin . In humans autopsy, islet amyloid polypeptide and hyperphosphorylated tau were found in pancreatic islet cells of patients with T2DM. An increased amount of neurofibrillary tangles and amyloid plaques in the hippocampus have been found on autopsy in patients with diabetes . The islet amyloid deposit was identified as a 37 amino acid peptide and named islet amyloid polypeptide (IAPP) or amylin. The amino acid sequence and structural properties of IAPP1–37 and Aβ1–42 are shown. Alignment to reveal the major overlap (~90%) in structural properties of IAPP20–28 and Aβ25–33, areas that are hydrophobic and therefore likely to be a target for binding by chaperone proteins. In the case of IAPP, the abnormal aggregation occurs initially intracellularly, and after cell death, IAPP-derived fibrils accumulate extracellularly. Similar mechanisms are also possible in Alzheimer disease. In both diseases, a locally expressed protein (Aβ in Alzheimer disease and IAPP in type 2 diabetes) is deposited in amyloid deposits with a gradual decline in the number of cells of the respective proteins. 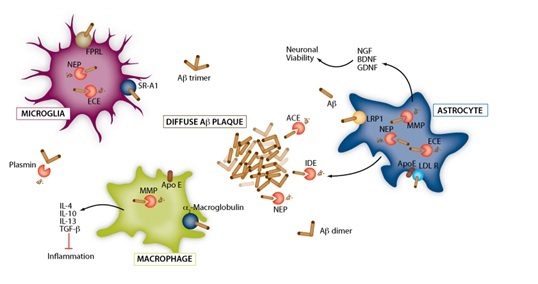 Amyloid deposits of both Aβ and IAPP, or more likely their oligomeric precursors, are cytotoxic by a mechanism that may relate to membrane disruption. Because both of these proteins spontaneously form amyloid fibrils in vitro in the aqueous environment present in the cell, mechanisms must exist in health to prevent this aggregation, which presumably include the chaperone protein pathway. All newly synthesized proteins are bound by a chaperone protein that has the function of preventing insoluble proteins (e.g., IAPP and Aβ) from aggregating in cells and trafficking the protein to its appropriate subcellular location. In addition, type 2 diabetes and Alzheimer disease increase in prevalence with aging, and cell chaperone protein capacity declines with aging, which would be expected to reveal any partial deficiency in chaperone capacity with aging. Therefore, one potential explanation for the reported shared risk for Alzheimer disease and type 2 diabetes is that IAPP and Aβ share one or more chaperone proteins and that a functional defect in this shared pathway (decreased chaperone protein binding, decreased chaperone protein availability) results in a shared vulnerability for Aβ to aggregate in β-pleated sheets in cortical cells and IAPP to aggregate in β-cells. It is well established that Aβ results from cleavage of APP precursor by secretases (α, β, γ) . Senile plaques develop from the release and accumulation of Aβ peptide. The Aβ interacts with signalling pathways that regulate the phosphorylation of the tau protein, leading to hyperphoshorylation of tau and aggregation of neurofibrillary tangles in neurons. Tau phosphorylation in both AD and T2DM involves activation of glycogen synthase kinase-3 (GSK-3) , which phosphorylates glycogen synthase in the rate-limiting step of glycogen biosynthesis. Glycogen synthase kinase-3 is a crucial step in formation of neurofibrillary tangles, and therefore, GSK-3 inhibition could be a common target treatment of both AD and T2DM. 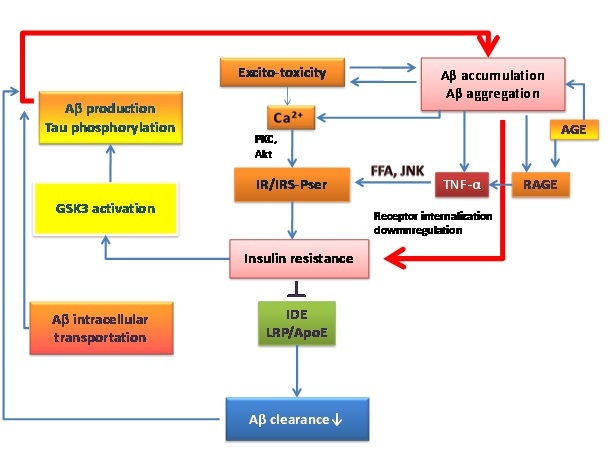 The insulin resistance could interrupt Aβ catabolism : Aβ amyloid catabolism happens into microglia, Aβ can be cleared through LDL-receptor (LRP) related protein-mediated endocytosis and its ligands ApoE and α2-macroglobulin or through direct extracellular proteolytic degradation process that involved insulin degrading enzyme (IDE) , neprilysin (NEP) and other metalloenzymes. Insulin-degrading enzyme (IDE) is a major Aβ-degrading enzyme the brain and catalyses the catabolism of insulin in the liver, kidneys and muscles. Insulin seems to stimulate Aβ secretion and inhibit the extracellular degradation of Aβ by competition for insulin-degrading enzyme, resulting in decreased Aβ degradation. Hyperinsulinaemia in people with type 2 diabetes might interfere with Aβ metabolism by stimulating its secretion and inhibiting its breakdown. Insulin degrading enzyme is a Zn2+ thiolmetalloprotease, which requires both a free thiol and bivalent cations for its activity as a protease. It is a single polypeptide with a molecular weight of 110kDa, can be dimers or trimers forms . The IDE active site consists of the sequence His-Glu-aaaa-His (HEXXH) in which the two histidines coordinate the binding of the zinc atom and the glutamate plays an role in catalysis. IDE was co-isolated with the multicatalytic proteinase, suggesting that IDE might be involved in a protein complex. The gene encoding IDE is located on chromosome 10q23–q25 in humans. It spans approximately 120 kb, and contains 24 exons and large sequences of introns. The coding sequence is highly conserved during evolution from E. coli, to Drosophila, to human. The IDE gene variation predicted risk of late-onset AD in the absence of ApoE4 allele, the major risk factor of late-onset AD. IDE is ubiquitously expressed, with its highest expression in the liver, testes, muscle and brain. Its expression is regulated during cell differentiation and growth with IDE mRNA level increased in the brain and testes when development proceeds . Furthermore, IDE expression is affected by aging, with IDE activity significantly decreased. The subcellular localization shows that IDE is abundant in cytosol and peroxisomes. In addition, IDE is also found in rough endoplasmic reticulum (RER), plasmamembrane as well as in the extracellular compartment. The substrates of IDE are several short peptides with molecular weights of 3–10 kDa including insulin, insulin-like growth factors I and II, amylin and Aβ. The peptide substrates share similar secondary structure and amyloidogenic character. Under physiological conditions IDE is secreted at high levels from the microglial cells, and degrades Aβ extracellularly. Its has been hypothesize that the imbalance of the substrates could affect the degradation process by IDE, and thus influence the pathogenesis of AD or T2DM. An increasing amounts of insulin, a substrate of IDE with low Km (Km =∼0.1μM) , specifically inhibited enzyme activity for degradation of Aβ (Km >2μM) in the cell culture model for secreted IDE. Therefore, if the insulin level increases in the brain, it would inhibit IDE to degrade Aβ, which could cause Aβ neurotoxicity, and then AD. In addition, an association of AD with diabetes and insulin resistance has been reported and genetic studies find insulin signaling genes to be susceptibility loci for AD. There are the association of polymorphisms the tree genes SOS2, PCK1, and PPARγ. SOS2 codes for the homolog of the SOS1 gene, which is a guanine nucleotide exchange factor. 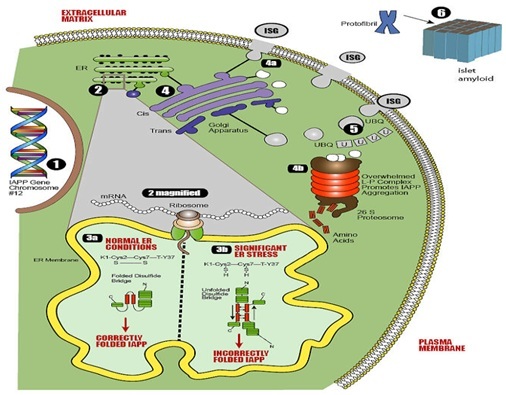 These proteins are involved in signal transduction pathways, including insulin signaling. PCK1 protein , PEPCK-C, catalyses the first step in hepatic gluconeogenesis and as such it has been implicated as one of the many genes associated with T2DM. Sims-Robinson, C. et al. (2010) How does diabetes accelerate Alzheimer disease pathology? Insulin resistance and amyloidogenesis as common molecular foundation for type 2 diabetes and Alzheimer’s disease. Zhao WQ, Townsend M. Biochim Biophys Acta. 2009 May;1792(5):482-96. Epub 2008 Nov 5. Insulin, insulin-degrading enzyme and amyloid-beta peptide in Alzheimer’s disease: review and hypothesis.Qiu WQ, Folstein MF. Neurobiol Aging. 2006 Feb;27(2):190-8. Epub 2005 Feb 17.